One tireless and visionary Ottawa entrepreneur has come up with an innovative solution to the problem and he wants to know what Ottawa’s community and business leaders think about it. He’s not looking for funding at this stage, only a constructive exchange of ideas to explore what is within the realm of possibility. Vijay is a philanthropist motivated by the poverty and hardship he grew up with in his native India. He has developed a self-sustaining funding model for charities that would eliminate their annual scramble for dollars, and reduce how many of those dollars are consumed by administrative and fundraising costs. The premise is simple: construct a mixed-use development that operates on a not-for-profit basis. Any net profits are donated to charity. The site could be used for almost anything: a convention centre, a retail space, commercial office space, condos or some combination thereof. Vijay has already invested almost $1million of his company’s earnings into the concept. Ideally, this design could be replicated and reproduced in cities across Canada, the U.S. and even around the world. with deep personal meaning. When he was a child, his mother would tell him to be like the lotus flower. While such a design would push the boundaries of architecture and engineering, Vijay is confident it can bedone. In fact, HDR, an international architectural firm with offices in Canada, has already created renderings and a design. stretched further and generate returns for years to come. If he receives a sufficient expression of interest from the Ottawa community in coming months, Vijay intends to host an October/November event to showcase the project and feature the many charities supported by his VLN Reach Foundation. 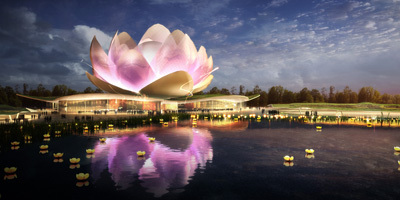 The belief, confidence, and dogged persistence required to make the Lotus Building a reality is second nature to Dr. Mohan Vijay. The nuclear engineer worked tirelessly for more than 15 years to commercialize the basic concepts developed at the National Research Council, refusing to be dissuaded by critics and skeptics, before at last securing a major deal with Pratt and Whitney USA, a subsidiary of United Technology Corporation. VLN Tech specializes in forced pulsed and cavitating waterjets – devices that dramatically improve the performance of conventional waterjet technologies for removing coatings, prepping surfaces and many other industrial applications, such as landmines clearance, without using abrasives or chemicals. Because VLN’s technology can take an existing water stream and amplify it by such a magnitude in the nozzle, users have a more powerful and versatile tool at their disposal without having to invest in larger and more expensive equipment. Operating and maintenance costs, parts stresses and power consumption are all reduced. Despite the benefits, it was a long road for the company to secure market traction. Vijay founded VLN Advanced Technologies in 1998, but the first major customer didn’t come until 2011, when Pratt & Whitney USA, which designs, manufactures and services aircraft engines, came knocking. Rather than take that windfall and retire to a tropical beach, the 75-year-old decided to use his company’s profits to help children in need and make the Lotus Building a reality. He created the VLN Reach Foundation and already supports the Make A Wish Foundation, the Ottawa Hospital Foundation, the Ottawa-Carleton Association for Persons with Developmental Disabilities, the Brain Injury Association of Canada, Propeller Dance and also makes cash donations to several charities each year.